You have so much say in your financial reality. I love your big dreams and want to help them grow, so if I can help you even a tiny, teensy bit with getting those money stresses off of your shoulders it would be totally worth it. In this latest installment of my Money Series, I’m talking all about how you can max out the wealth you earn from your endeavours and investments. There’s no such thing as “too much” in my books! 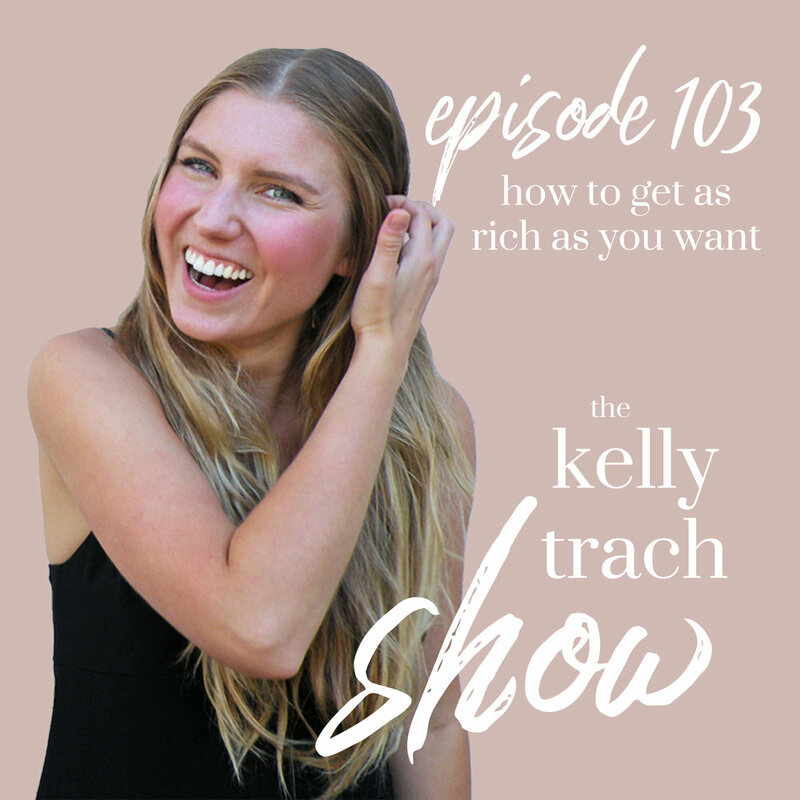 In this episode, I break down my patented Kelly Trach formula, why you need to tackle creating wealth like you’re applying to Harvard medical school, and the importance of taking sole responsibility for your financial reality. And listen close for my 24-hour challenge! - How to carve out a clear strategy that will lead you down a straight path to riches. - The difference between paycheck-to-paycheck mindset and prosperity mindset. - The “Harvard med school” approach to creating wealth. - How to get the magical fairy dust you need from a successful social group. - Why spending money to make money isn’t a cliché but a cold hard fact. - Why you alone are responsible for your financial reality. - Figuring out how you can set off on this path within the next 24 hours; when you do, DM me @kellytrach on Instagram! Podigy. Podigy is the company the edits and produces The Kelly Trach Show and I am forever grateful for them. If you are ready to take your podcast to the next level, get professional editing and finally delegate it out, then Podigy is your jam. I adore working with them because they are super on the ball and make this show sound like the 5-star podcast that it is. When you sign up, mention “The Kelly Trach Show” to get 50% off your first month of editing. Bench Bookkeeping. It's automated bookkeeping and all you have to do is sync your credit cards, bank accounts, website and then upload bills. A real bookkeeper will do the rest! It makes my life a total dream. When you sign up here, you’ll get 1 free month of bookkeeping + 20% off your first 6 months. With that free trial month, Bench will do your last month’s books with no credit card required so you can test it out, see the graphs, the statements, and how it works! Literally one of the best investments I’ve ever made in my business. A FREE 6-day video course to bust through your blocks, step into your self-worth, and change your financial reality for good. Wealth begins with your mindset.